Drs. 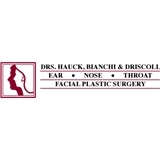 Hauck, Bianchi & Driscoll, PA (Silver Spring) - Book Appointment Online! Providing world class ENT care to both adults and children. she is very kind, and was open to answer any questions.